I’ve thought about making Sundays, ‘Silver Screen Sundays’, from now on – I love movies more than just about anything, so I’ve decided I should write about some films I find inspiring, fashion-wise. The first of these is an Australian movie which, this year, is celebrating its 20th birthday! 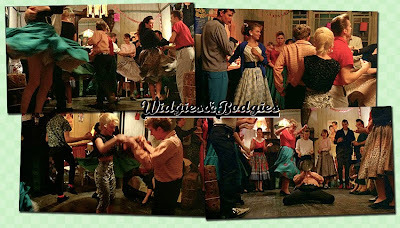 The Delinquents stars Kylie Minogue, my favourite pop princess, in a story about two young lovers, Brownie Hansen and Lola Lovell in 1950s Australia. Although there is a very definite 1980s feel to a lot of the costumes, I think they’re still fantastic. It seems that teenage fashions in the 1950s gave rise to unique descriptions around the world. Thus the bodgies and widgies are to Australia what the teddy boys were to Britain and rockers were to the United States of America. * They seemed to be wonderfully original at the time with the boys boasting greasy hair (with a quiff, ducktail and long sideburns), tight trousers and flash shoes (either brothel creepers or leather shoes with pointy toes**) and girls having bouffants, ponytails, impossibly high heels, and rope petticoats under their skirts which radiated out from wafer-thin waists. Of course, these styles were imitated from overseas but the names were uniquely Australian. *I believe this is erroneous as ‘rockers’ is also a British term (think Mods and Rockers) and these teenagers were known as ‘greasers’ in the US. I think my favourite item out of everything here is the leopard print circle skirt! Lola starts out as an everyday teenager – a little bit of a square, I suppose – and, although her outfits are still lovely, I wanted to focus on her clothes when she becomes a widgie. I love her ponytail – its simple and a little cute but still has an edge to it. 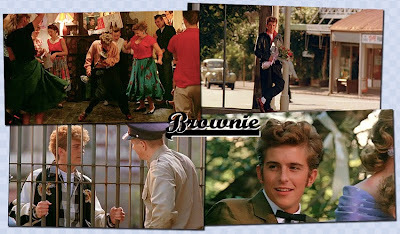 Brownie's style changes more subtly than Lola but he certainly ends up a lot 'cooler', too. So, after that, do you find yourself wishing you were a widgie? I certainly do! The black peasant top, from Pin-Up Parade, is very similar to the one Kylie wears as Lola in the film. 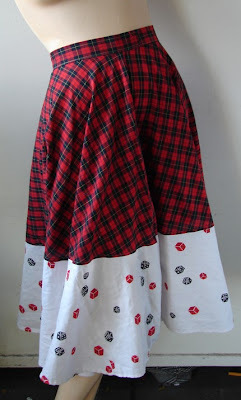 And you could certainly show your rebellious side in this plaid and dice print circle skirt, found on etsy. 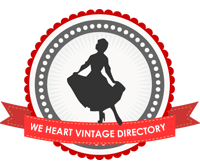 Of course, you don't have to wear a skirt to be a widgie - these capris found on Pin-Up Parade are perfect. And the blouse is very similar to one Kylie wears in the film, too. And for the fella who fancies himself a bodgie…There are a variety of amazing bowling shirts to be found at Daddy-o's. A pair of creepers...or, perhaps, you prefer winklepickers? And you'll need some pomade for your duck's tail. I couldn't find any trousers about but a nice pair of drainpipes would go very well. I had a lot of fun compiling this post, so I hope everyone had fun reading it. Do you think it'd make an interesting weekly feature? I've uploaded some more screencaps here, on my flickr. Frances: I'm so glad you like it! =D Gosh, I know what you mean - I can't think of any other Australian films set in this period. I may have to try to search some out! i think this is an awesome idea! i've never even heard of this film and you'll just give me more ideas to check out! I'm down with this as a regular :) I love all your pictorial references! This looks like a great movie, I love The Year My Voice Broke which is set in the early 60s and its sequel Flirting. Sarah: Thank-you so much for your thoughtful comment. =] I'm glad you enjoyed it. Great post. I love the Delinquents. You've inspired me to rewatch it soon. Louise: Thanks. I'm so glad someone else has actually heard of it! Haha. the freelancer's fashionblog: Yeah, it's very true! I haven't seen that version of Nosferatu, yet, but there were a lot of films from the 70s and 80s that were set in other eras but didn't really look like it! Very nice post ! Thank you ! you know, im always trying to find really good tops to wear with my higher-waisted skirts, and often find the secretary blouses that are so easy to find a little too dowdy, but that peasant top has really turned me on to a new shape to look for! i try not to buy online, but ill keep my eye out for similar cuts, thanks for the help!